writing – Teach. Empower. Transform. Hello, my name is Libby, and I’m in the eighth grade. Today, I will be telling about my experience in FLOC and how it helps me learn. This year, I have learned a lot in FLOC. I have improved in my vocabulary and in my reading in school. My teachers were really excited when I improved in my reading. I think FLOC is a great place for someone who needs help with reading or math. I also improved on my writing because my tutor Sarah and I do journaling. Journaling is when you have to pick a subject and write about it and then your tutor checks for any mistakes and how you can improve. I think improvements will help me because I want to become a journalist or a lawyer, but for each one you need reading and writing. FLOC is the best place to improve on reading or math. My favorite memory of FLOC is when I met Sarah. Sarah was really nice to me when I met her and that was my favorite memory because it was the first time meeting someone from the government (Sarah works for government when she’s not volunteering). Sarah is really a understanding person. She’s nice, caring, radical, makes delicious cookies and is THE BEST TUTOR EVER!!! If Sarah is in FLOC next year I hope I’ll be with her again. In conclusion, I think anyone who reads this should take my advice because FLOC is a great way to catch up to your education. For the third year in a row, FLOC Scholars in Washington have been pen pals this semester with FLOC Leaders in Action students in West Virginia. These middle schoolers live less than two hours away from one another, but those 70 miles represent a significant difference between the urban environment of DC and the rural environment of Jefferson County. As program wraps up this month in both places, we thought we’d take a look back at the letters these middle school students have written over the last few months and the relationships they’ve formed in the process. They’re chatty, inquisitive, friendly, and colorful, punctuated with drawings and P.S.’s and jokes. They talk about their favorite foods and TV shows, video games and YouTube stars, Star Wars and Deadpool and Alvin and the Chipmunks, winter break snow and spring break plans. They shatter misconceptions (No, the West Virginians don’t live in barns. Yes, there are places to sled in DC.) There’s even a little touch of election politics conversation. Most of all, it’s clear that for all these students live in different communities, they have a lot more in common than not. It’s also clear that friendships are blossoming via their writing. 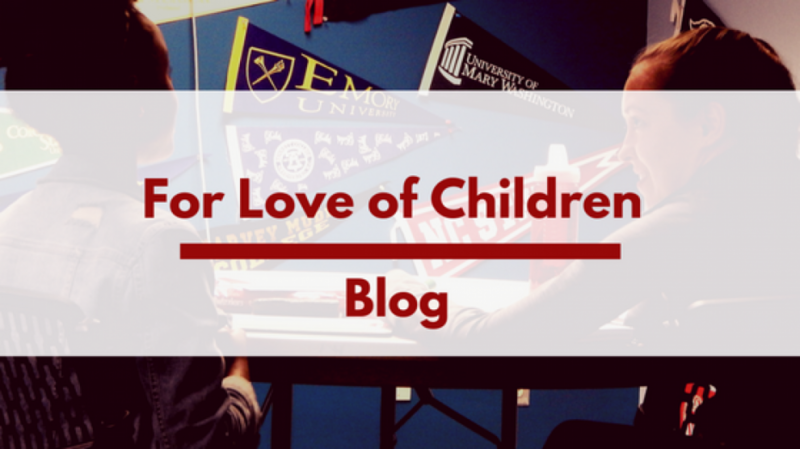 This school year at FLOC has been the start of a new partnership with Savoy Elementary in Anacostia. While this is a smaller program it allows us to work in a school to help kids who may not otherwise be able to make it to the FLOC office. With FLOC being during Savoy’s after school program, the kids are already out of class by the time we get there and there are always a couple kids waiting excited. There are very few things better in tutoring than seeing kids excited for tutoring. One student in particular is not the biggest fan of reading but her tutor decided that one way to get her more interested in reading was to have her create her own story. Each week they spend time working on the story making sure she has proper grammar and that the story is making sense. This has allowed her to grow her own sense of creative thinking and help the tutor discover more about what she is interested in. Seeing all of the different ways to get these kids to learn without them necessarily feeling like they are in standard classroom has been a lot of fun. Not only are these kids enjoying the one on one contact but the tutors are having a lot of fun getting to know the kids and learning what works and doesn’t work. There are four months left in the school year and it will be interesting to see how much these students improve in this time and how that directly affect their grades and progress in school. On Saturday, November 14th, the holiday season officially kicked off for FLOC students as they were able to take home as many free books as they could carry (with the help of parents and tote bags). FLOC held its 9th Annual Book Festival, which aims to further foster a love of reading by growing our students’ libraries. Thanks to the hard work and generous donations of partners, we were able to offer almost 1,500 books to our students. In addition to the book giveaway, Karen Legget Abouraya, author of Malala Yousafzai: Warrior with Words, spoke to students about the importance of education and fighting for what’s important. Inspired by Malala’s courage to fight for her right to an education, students made pledges about what they will stand up for. After the presentation, students were given their own copy of Warrior with Words and were able to meet the author to have her sign their copy. The PBS Kids character Super Why, who has students use their reading comprehension skills to solve mysteries, also made an appearance to meet and take pictures with the students. PBS local affiliate WHUT brought along iPads for students to try out new reading apps, which allowed students to have fun while also improving their reading skills. In the book room, students filled up their WHUT tote bags with as many books as they wanted, with many students getting so excited that they needed extra bags to hold them all. Staff members and volunteers were on hand to give book recommendations to curious students, using the opportunity to reflect on their favorite books from childhood. From Dr. Seuss to Diary of a Wimpy Kid to The Autobiography of Malcolm X, kids of all ages were able to either start or grow their own personal library. FLOC could not have held this event without the support of our sponsors, Alderson Court Reporting, Reingold LINK, and Sedgwick LLP. Additional support was provided by our generous hosts, the Pepco Edison Place Gallery and by PBS affiliate WHUT. We also are thankful to WHUT for bringing Super Why, iPads with reading apps, and tote bags for the students to take their books home in. Lastly, we want to give an additional thank you to all those who donated the 1,500 books that we were able to give away. All of our event sponsors listed above held book drives to contribute, as did the Advisory Board Company and SIGAL Construction Companies. Additional books were provided by First Book, Friends of George Mason Regional Library, and by individual board members and friends of the organization. Many thanks to all for helping make this event a success! This year, FLOC is again offering elective workshop units to our Middle School Scholars Program. These electives are designed to introduce students to a variety of topics in new ways. Zine Making 101 is offered as a fun and interactive way to introduce students to writing and publishing. Developing excellent writing skills is very important but can be intimidating for many students when presented in the traditional classroom manner. In a workshop environment, students are able to research topics that interest them and craft a zine based on their interests. So what is a zine? The term ‘zine’ is shortened version of the word magazine. Zines are usually short self-published collection of texts and images. Although print is the most common format in the zine world, online zines have become increasingly popular. In our zine workshop, students are exploring the world of zines and will be publishing their own online zines. Students in the workshop have had the opportunity to not only write the text but also produce images as part of their content. So far, they have focused on music, animal rights activism and vidogaming. With a little direction from staff, students have begun to discover the ways in which they can further explore their interests through writing. Students have not only demonstrated a strong interest in this genre of publishing but have also committed themselves to producing the best possible work possible. They research, draft, review and edit each piece of text and have even begun to create themes for each of their projects. The zines will be completed and published in January and students are excited to be able to share their work with the rest of the FLOC community and the world. Foday and Kim at the 2014 Recognition and Empower Awards. 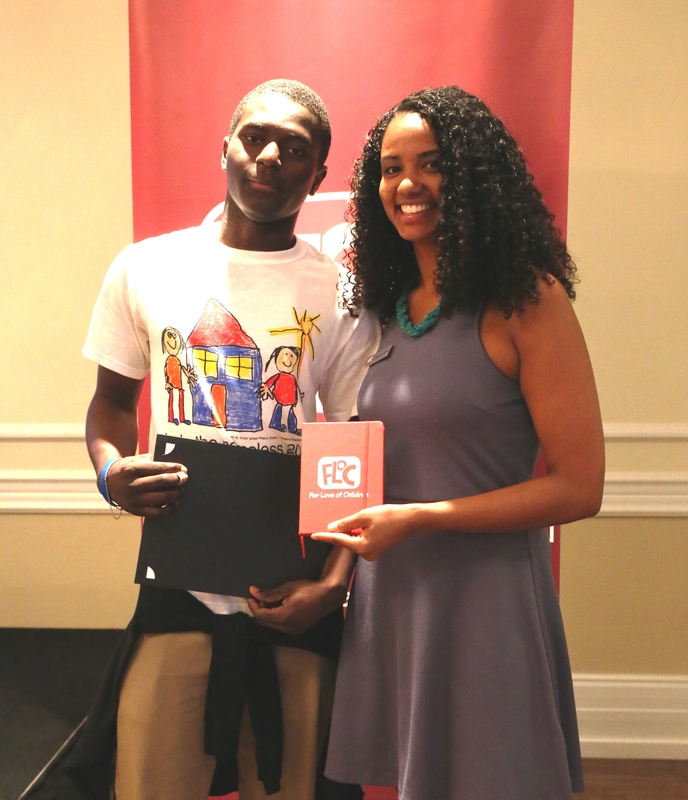 Foday is a rising 11th grade student at Bell Multicultural High School and has been involved with both the FLOC Scholars and Neighborhood Tutoring Programs since the 8th grade. 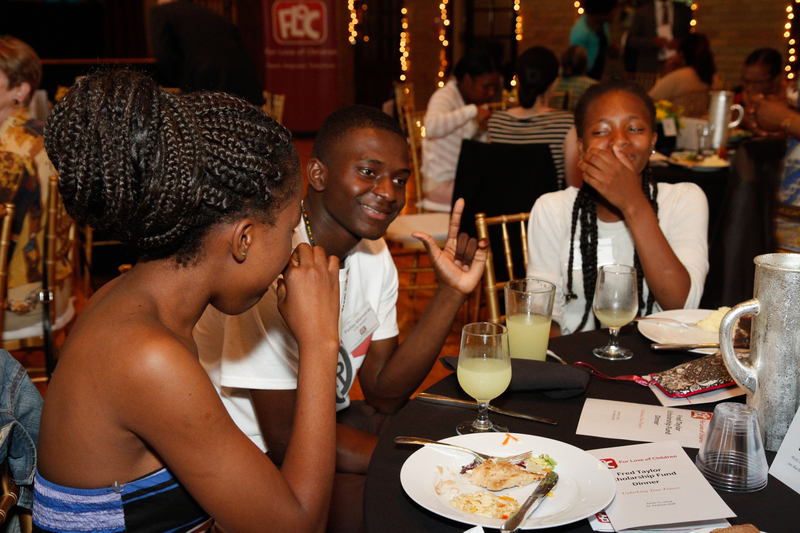 Foday at the 2014 Fred Taylor Scholarship Fund Dinner. 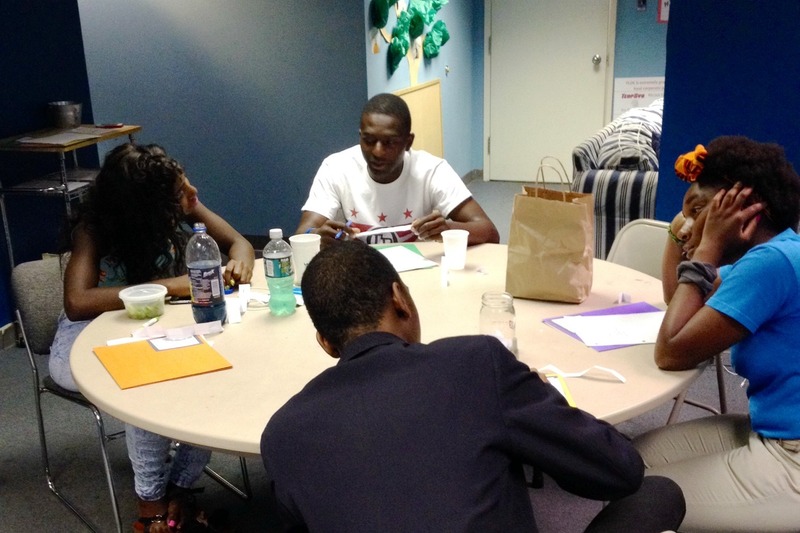 For five weeks this summer, Foday participated in the high school Tell Your Story Writing Workshop Series, where he and his peers learned how to be their own best advocate through self-reflection, written expression, and storytelling. Foday is one of the quieter students in the bunch, but he showed up each and every week, ready to engage with the material and speakers and take full advantage of the opportunities to explore, write, and share his personal story. As weeks two, three, and four passed, Foday continually exemplified active listening and opened up during peer interviews. And when it came time to write, he was in his element. His quiet confidence radiated as he wrote stories about his past, present, and future. When week five finally rolled around, I couldn’t wait to see how Foday decided to reveal his final writing piece. Turns out, Foday connected his stories to form one and chose to share his work on this very blog. I hope you will find Foday’s story below as impressive and inspiring as I do. He’s ‘going places’ and FLOC will be with him every step of the way. Growing up in a family of seven has been the best thing in my life. As a kid, my three sisters and I lived in a big house in Sierra Leone. Being the only boy in the family wasn’t easy; I always did things by myself even though sometimes I needed help. My parents depended on me the most and I also had to work harder. But no matter what, I wanted to do things successfully. In the future, I have decided I want to work hard to help people in need. My family and my community motivate me to be successful. Seeing other families losing their loved ones due to incurable diseases or not being able to pay medical bills makes me very sad. If I can help my community and other people it would be a great benefit to others and I would feel fulfilled. 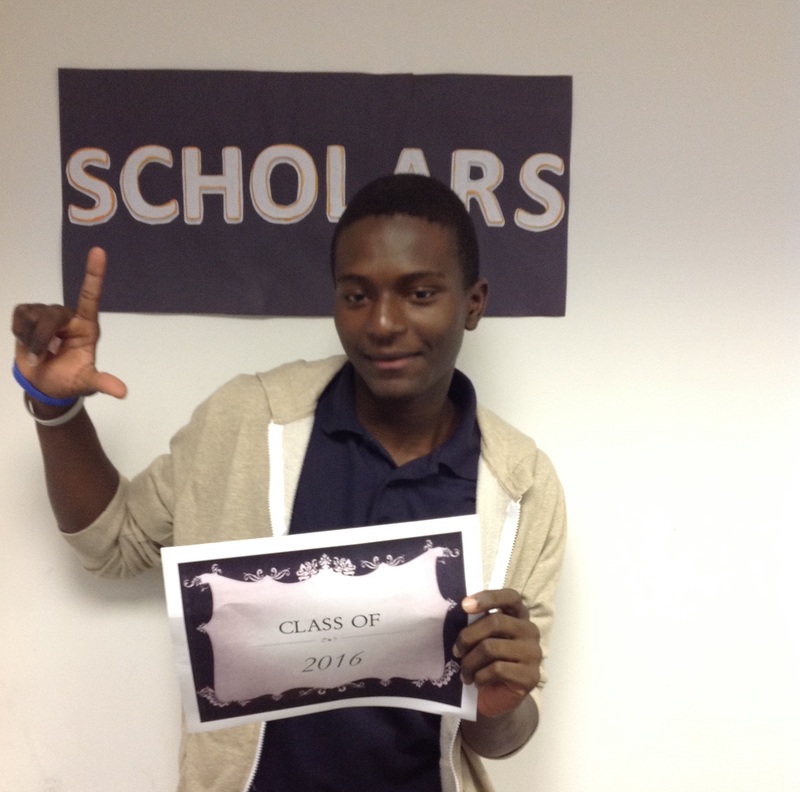 (Jessie Garrett is a Scholars Program Instructor at FLOC).